This Out of Service Bonnet (EC Part #81951) is a quick and sanitary method to designate that a variety of fixtures are out of service. This temporary cover notifies employees and/or patrons that a fixture is currently unavailable for use. It is made out of spun bonded polypropylene, and is inexpensive and disposable. It adhere’s to the out of service unit with an elastic band and elastic ties, enabling the plumber or maintenance department to securely wrap the bonnet around a variety of size and shape fixtures. • And Many Other Applications. Sooner or later, the equipment at your facility will stop working and need to be serviced. Are you prepared to signify that your fixture is out of service in a professional manner? Out of Service Bonnets are the professional out of service covers all facilities should keep in stock. The multifunction nature of this item makes it ideal for many commercial businesses including hotels, restaurants, small businesses, industrial plants, and many other locations. The Out of Service Cover is an item we recommend all facilities to keep in stock. Not only is it a professional item to notify your patrons of an out of service fixture, but it also increases employee efficiency by having a cover on hand. It eliminates employees needing to take the time to create a makeshift sign and cover that would likely be an unsightly combination of masking tape, trash bags, and/or cardboard. 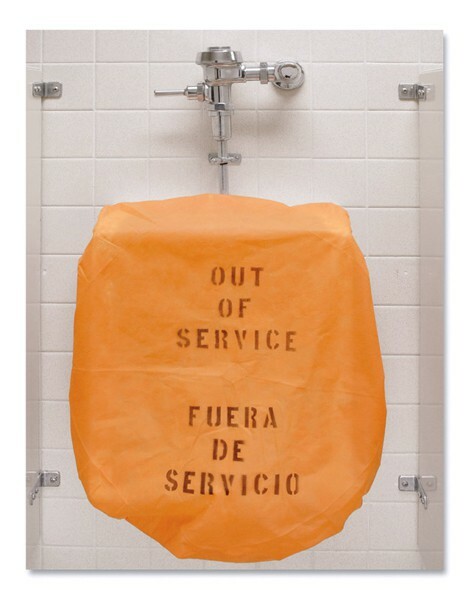 Share the out of service bonnet with your facility manager or purchasing department easily by sending them the Urinal Out of Service Bonnet (#81951) PDF or view it on our website: Out of Service Bonnet.